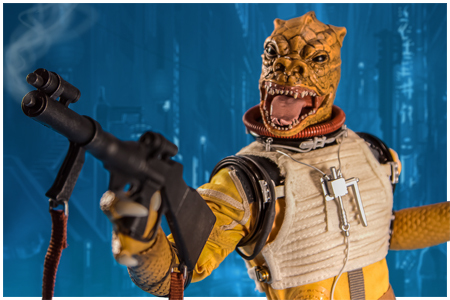 While Sideshow Collectibles' Bossk figure was officially announced and went up for pre-order on June 29, 2012, collectors got their first look at it five months earlier when a sneak peek video was published to their site on January 22. 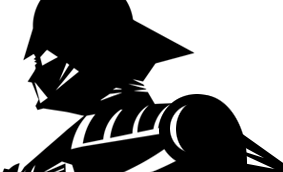 Bossk began shipping in January, 2013. While the feature film version of Bossk is left handed, this figure follows the long histpry of making the character right handed. One right hand has a port in it to help support the rifle in action poses. The post on the rifle will only fit in the port if the right hand is on the right arm, so switching it over to the left hand will not work. In The Empire Strikes Back Bossk is missing one of the Signal Flares on his right leg. Since they are all removable, it is easy to make the figure that much closer to screen accurate.